Heroes of the Storm has officially launched! Nexus portals will continue to open around the globe today as new players charge into the brawl for the very first time. To help celebrate, we have a ton of new content available, including a new Hero, a massive XP Boost event, an exclusive player portrait, new Mounts, and much more. Check out the complete patch notes below, and then log in to Heroes to join the party! Beginning today, June 2, all Heroes of the Storm players can get their account progress off to a flying head start with an epic XP Boost event that spans the next three weeks! The amount of bonus XP offered for completing games in any matchmaking mode will double with each passing week, so be sure to take advantage of this event before it concludes on Wednesday, June 24. Click here to learn more. All players who log in to Heroes of the Storm during the week of June 2 – 9 will receive an exclusive player portrait that they can use to show off their excitement for the game’s release. During the week of June 2 – 9, all players will receive a 50% discount on the purchase of one 30-day Stimpack. Once purchased at the discounted rate, subsequent 30-Day Stimpacks will return to normal price. Any players that complete a real-money transaction using the in-game Shop on, or after June 2, will receive the Billie the Kid Mount as a bonus reward. Please note that, as mentioned previously, the Wonder Billie Mount will no longer be awarded now that Heroes Beta testing has concluded. Reach player level 12 in Heroes of the Storm to receive the Heroes of the Storm Cardback in Hearthstone. For those that play Heroes on the Americas region of Battle.net this reward will be granted later this week. Win 100 games in Hearthstone’s Play Mode to receive the Hearthstone Cardback Mount in Heroes of the Storm. This reward will not be available immediately on launch day, but will be granted in the coming weeks. Reach player level 20 in Heroes of the Storm to receive the Grave Golem World of Warcraft Pet. Reach level 100 in World of Warcraft to receive the Ironside Dire Wolf Heroes of the Storm Mount. 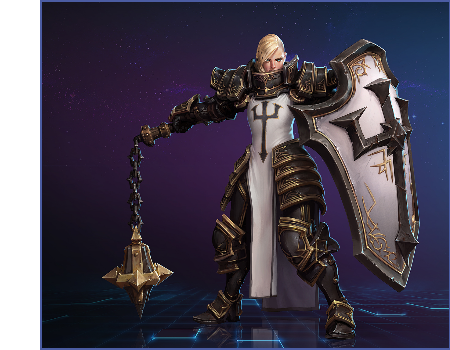 Johanna, Crusader of Zakarum, has been added to Heroes of the Storm and is now available for play! Read on for a brief overview of this devout new Warrior’s Abilities. Become Unstoppable and gain a Shield that absorbs damage for 4 seconds. Deal damage and slow enemies by 60%, decaying over 2 seconds. After a 1 second delay, you pull nearby enemies toward you, stunning them and dealing damage. Deal damage to enemies and cause them to miss their next 2 Basic Attacks within 4 seconds. You leap toward an area. While in the air, you can steer the landing location by moving. You land after 2 seconds, dealing damage to nearby enemies and knocking them into the air. Deal damage and stun the first enemy hit for 2 seconds. Blessed Shield then bounces to 2 nearby enemies, dealing half damage and stunning them for 1 second. The Centurion Johanna Bundle Pack has been added to the in-game Shop for a limited time. Johanna’s Master Skin has been added. The Centurion Johanna Skin has been added.